On Friday June 21, a Memorandum of Understanding (MOU) was signed formalizing the continuing Open Data in Agriculture initiative between the Rural Agricultural Development Authority (RADA) and Mona School of Business and Management (MSBM). 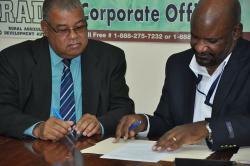 The MOU explores Information and Communication Technology (ICT) enabled innovations to support the enhanced delivery of Agricultural Extension services to farmers across Jamaica. The agreement signals efforts to forge value-adding partnerships between Agriculture, Academia and the local technology community to benefit from the collective wealth of data, research resources and technical expertise resident between the public and private sectors and academia. Harnessing the synergy from these three constituents may play a significant national and economic development of which agriculture is one of the pillars. The Open Data in agriculture partnership serves as a pilot for a broader regional initiative called Code For The Caribbean (CftC) that seeks to partner with innovative government agencies, such as RADA, to help them become more agile, open and participatory. Under the CftC fellowship program, teams of technologists are embedded within government institutions to enable a new approach to creating and delivering services that embraces new technologies, centres around an iterative citizen-centred approach to service design, and produces software and tools that are built for re-use across government. CftC is the result of an on-going collaboration between MSBM, the SlashRoots Foundation (Slashroots), and the Caribbean Open Institute (COI), a regional initiative funded by the International Development Research Centre (IDRC). CftC has been endorsed as a member of the Code For All Network, the International Program being developed by the Code For America Foundation and joins a growing community of similar programs in the Americas, Europe and Africa. The MOU will be executed as a Fellowship programme, in which three (3) technology fellows will be embedded at RADA over a six (6) months period. During this period they will gain valuable experiences in the operations of the organization, its role in agricultural extension delivery and its relationship/interfaces with the wider industry and stakeholders . The fellows will use Open data as a catalyst to develop a portfolio of innovative Apps focused at addressing Praedial Larceny and agricultural production planning & tracking. *Provide a framework of an on-going internship/exchange partnership initiative with educational institutions.